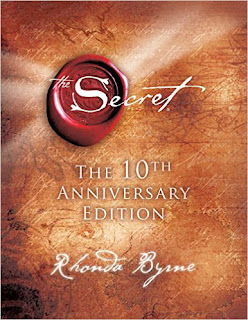 The Secret is a self-help book by the Australian author Rhonda Byrne trying to explain how your thoughts are the driving force of your life. This wasn’t a book that I couldn’t avoid for too long for I always found this book in large numbers in bookstores; not just in English but in a lot of other languages which naturally kindled my curiosity as to what was so special about this and also the fact that the same was ceaselessly suggested by some of my friends. The book starts with revealing The Secret which I believe is the law of attraction proposed in this book, that is, you attract what you think and your life is crafted by your thoughts. It the sequentially mentions how this law could be used for wealth, relationships, health, weight reduction, etc. I liked it as to how the book is trying to trigger positive thinking for that is something I lack; in the sense that I think of all the possibilities and under the doctrine of being prepared for the worst, I more often than not, think only about the worst possible outcome and I guess I would use some of what the book has said to ensure a balance. The book also endorsed one of the strongest philosophies that I believe in; something which I liked (which is not agreed upon in most supposed spiritual books); that you’re the master of your own fate / destiny. I also liked the way in which the book was presented; each discussion being split into various chapters and then, at the end of each, you had a summary of what was stated in each of these chapters. The book was also concise considering the whole message was delivered in around 200 pages meaning that you don’t have to be a voracious reader in order to complete this book. However, my problem with this book, predictably, was the excessive justification through pseudoscience; for one, comparing this law of attraction on a par with the law of gravity is outrageous to being with and two, some outrageous claims were made by the author where she stated that even though she didn’t study physics, by sheer thoughts, she perfectly understands quantum physics today; a topic which most physicists have struggled to crack with this popular quote from the physicist Richard Feynman – ‘If you think you understand quantum mechanics, you don't understand quantum mechanics.’ Moreover, I believed that this book could be taken to induce positive thinking on the topics but then; her tips on topics such as health or financial management or dieting should be straightaway dismissed. I always like reading on topics which I don’t ideologically agree with such as metaphysics, in this case and to be honest, I had a good time reading this book and some of the author’s suggestions were good which I could possibly implement and of course, predictably, I was totally outraged by some of her comparisons and analogies which I have touched upon previously. To conclude, I would say that this is a reasonable book with some practical solutions and a lot of codswallop. On the whole, I would award the book a rating of six.